The Natural Resources Commission finalized several regulations impacting the 2015-2016 fishing season at its meeting on April 9. Fishing regulations are adjusted annually to ensure Michigan’s fisheries resources are managed properly and to provide the best benefits to anglers and the public. Due to the Natural Resources Commission’s temporary loss of regulatory authority, several regulations were not determined in time for the start of the 2015-2016 angling year (April 1) and consequently were not printed in the hard-copy version of the Michigan Fishing Guide. However, there are several areas of the guide that have an orange star to indicate that changes possibly would be forthcoming. As 2014 draws to a close and we look forward to the New Year, I would like to share a few thoughts about this year, as well as express my extreme gratitude to our valued customers and friends for a truly wonderful year. All of our guide services were blessed with another very busy year guiding some really wonderful customers. We loved fishing with our old customers, and we relished the opportunity to fish with new customers as well. Sport Fish Michigan’s Captains and Guides enjoyed fishing with their customers, as always. Traverse City Bass Guide Service had another incredibly busy year. Bassmaster Magazine ranked Grand Traverse Bays in the top 10 for best bass fisheries in the world. This brought additional attention to something many of us already knew—just how special this fishery really is. Wolfe Outfitters and Manistee River Salmon Guide Service were both as busy as ever. With multiple Guides working, we enjoyed lots of guide trips fishing for everything from salmon and steelhead to brown trout, lake trout, smallmouth bass, and even panfish. Wolfe Outfitters became the only permitted guide service allowed to fish inside the Sleeping Bear Dunes National Lakeshore. This opened up the door to giving customers access to world-class fishing for coho salmon near the Platte River—the birthplace of the entire Great Lakes multi-billion dollar salmon fishery. We received quite a bit of great press as well, which is always appreciated. Traverse! Northern Michigan’s Magazine was nice enough to include our ice fishing in its newsletters, as well as sending out a writer and photographer to do an upcoming feature story on wintertime river fishing. Conde Nast Traveler released a terrific mention and photo of our guided ice fishing services in their story about the top things to do around the country in ski towns other than skiing! What a huge honor to be mentioned in this long-standing and very popular travel magazine. The Traverse City Convention & Visitors Bureau covered our ice fishing in both a newsletter and web story. Mountain Life Magazine, published by Crystal Mountain, also did a story about us in a feature article. We are working with a couple of writers out of Chicahgo for upcoming stories. The Angler Magazine did a feature article on us, showcasing the outstanding vertical jigging opportunities for lake trout on the Grand Traverse Bays. 9 & 10 News interviewed me for a story about bass fishing the Grand Traverse area, and Sport Fish Michigan sponsored the very popular national television show, Hook n’ Look. Hook n’ Look airs on the Outdoor Channel, and has the kind of loyal following any fishing show would want. In addition to the many small video clips we filmed ourselves, we also filmed a couple of different shows with a new fishing show that will air in January called iFishigan. This new show will air on the World Fishing Network. The fishing was outstanding in many ways, and odd in others. With the extremely cold winter we experienced, the spring thaw was delayed by almost a month. Downstate, the walleye fishing was outstanding on the Detroit River. Surprisingly, the cold waters didn’t cool the bite at all. Lots of walleyes, many of them impressive in size, were caught by Sport Fish Michigan’s Captains and Guides. The walleye fishery on the Detroit River is stunning, and anglers vertical jigging with our Guides had great catches most days. Bass fishing on Lake St. Clair was incredible, as usual. The winter, although brutal, didn’t seem to faze the fishing much, and the bite turned hot almost right out of the gate at the start of the season. Not surprisingly, Lake St. Clair’s incredible fishery kept its reputation intact, despite falling a bit in the Bassmaster Magazine top 100 best bass fisheries in the world. In northern Michigan, the cold took its toll a bit more, and it took longer to warm up. River levels were very high from the huge amount of snow that fell, and the spring steelhead run lasted much longer than normal. We were even fishing steelhead in late May on the Manistee and the Platte rivers! The walleye fishing on the rivers like the Manistee and Muskegon rivers was also very good. The opener to the season played right into the hands of anglers due to the cold water making for a later run. Normally, the run is over on the rivers before the season opener, but this year we were able to get on the walleyes in great fashion. Wolfe Outfitters guide trips not only were able to target trout and steelhead, they were able to keep many of the walleyes that were caught after the season opener. Throughout the season, the trout fishing was incredible and, even now, it continues to be stellar. The salmon and steelhead runs are something that many are talking about. Not only has the DNR decreased the amount of king salmon stocked into Lake Michigan, the conditions were such that we did not have a good fall run. Guide trips went well despite this, and customers still were able to have a great experience, even if the fishing was slower than customary. Bass fishing was stellar, as usual, but we weren’t able to enjoy the early spring bite as much as normal. Traverse City Bass had many thrilled customers despite some chilly water temps early in the season. With an unseasonably cool summer, many of the patterns ran late in the season, including the spawn. We even had spawning smallmouth in August! I’m not sure what that will mean for the success rate of the bass fry, but hopefully it won’t be too bad. We were able to showcase the incredible smallmouth fishery that we have to many new customers this year, and we enjoyed fishing with our repeats as well. It is such a treat to fish with customers every season—not only are they excellent customers, they also become friends. Sport Fish Michigan’s endeavors this past year included offering vertical jigging trips to customers using Wolfe Outfitters Guides and Sport Fish Michigan Captains. The jigging this year was absolutely incredible, and we were very fortunate to have the beautiful lake trout to play with this year. On light bass tackle, they put up an incredible fight, and this was something that all of our anglers thoroughly enjoyed. Especially when they can feel the bite, and get to set the hook as well as fight the fish the entire way in. On a personal note, I was nominated along with many other outstanding charter Captains, for the Best Charter Boat Captain in the annual Traverse Magazine Red Hot Best public poll. Traverse Magazine conducts this popular poll each year for the “Best Of” in Northern Michigan, and I was honored to be among the top 3 vote-getters in this inaugural category. Given the number of other nominees and some of the longevity of many of these fantastic Captains, it was very humbling to be voted among the top 3. In fact, to make things even sweeter, I was the only Captain in this category who actually offered fishing charters. The other two operate sunset cruises, capable of servicing many customers each time out. A huge THANK YOU to each and every person that voted to help put me on top! Our new boat that was trucked out from Washington State this past winter, and outfitted specifically to highlight the jigging technique. Our customers loved it, and it proved to be invaluable. It was a joy to be able to offer trips out of this boat, and its worth proved itself on the big waters of Lake Michigan, Grand Traverse Bays, as well as the L. Michigan waters of the Sleeping Bear Dunes National Lakeshore. It also functioned extremely well as a river boat, and its design proved priceless. The Evinrude E-Tec on the back of this 20-foot beauty is outfitted with a jet drive, and is able to handle both the bigger bodies of water as well as allowing our new boat to run on plane in water as shallow as 4 inches! Outfitted with a kicker motor, an electric anchor winch, Minn Kota i-Pilot link on the Terrova electric motor, and Humminbird Onix electronics, this is the ultimate fishing machine. Many of our Wolfe Outfitters and Sport Fish Michigan customers got to enjoy this new boat, and I think they would agree that it truly is an awesome boat to from which to fish. In part 1 of the article, we discussed some of the things that will help with trailer longevity, and a few things to check when putting a boat and trailer in for winter storage. In part 2, we will discuss some of the things that will help keep the boat itself in good working order come spring. Motor maintenance is a crucial aspect of boat ownership, and is one that is done by most boat owners. It’s our motors that we rely on to get us to our favorite fishing hole, and it’s our motors that often command the most attention when they break down. There are a couple of things that we should do when putting our boats up for the winter. The impeller is what pulls water into the motor to cool it. Needless to say, it’s a hugely important part of the motor. The impeller itself is fairly cheap, and that’s a good thing. 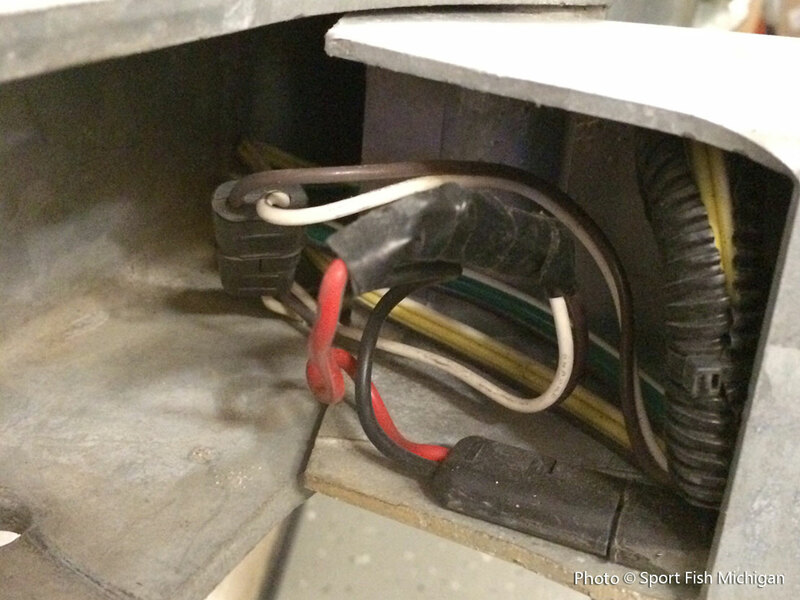 This one part is also one of the things to keep an eye on to ensure motor longevity. When our motors don’t “pee” the way that they should (spitting water out of the back of the motor), it is often either a partially plugged intake, or it’s an impeller going bad. Regularly replacing our motor impellers will keep the motor cooling itself properly and running long into the future. Impeller replacement is something that routine motor maintenance should take care of, but it’s advisable to double check that is has been replaced every other year or so. Spark plugs are an easy thing to replace, and can help keep a motor running at its peak. For motors that log a lot of hours like those being used by Sport Fish Michigan’s Captains and Guides, spark plugs should be replaced annually. For recreational anglers, perhaps every other year or so is acceptable. 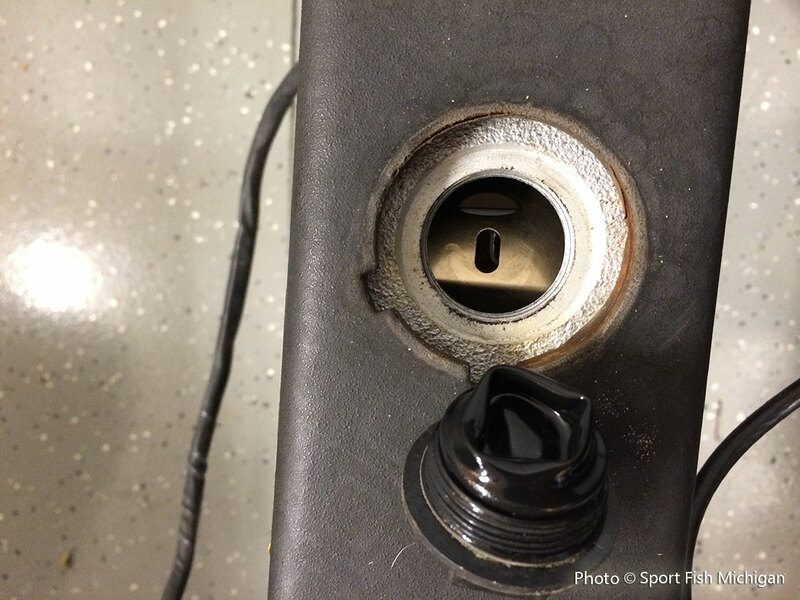 Poor motor performance can often be linked to a fouled plug. Water filters help keep water out of the motor, and with the ethanol in today’s gasoline, replacing this filter is an essential part of preventative maintenance. Replacing a water filter every year will go a long ways towards keeping water out of the combustion chambers. In fact, on all of my boats, I took the extra step of adding a second water filter. Should there be phase separation in my fuel tanks, a second water filter will help, and hopefully stave off very costly repairs. Storing a dry boat is much better than storing a wet boat. This will help to prevent mold during the long winter layover, making for a quicker and easier spring dust-off. One thing that I like to do is to leave compartments open to let air circulate freely. A closed compartment, especially with lots of things in it, will trap moisture and can become moldy. 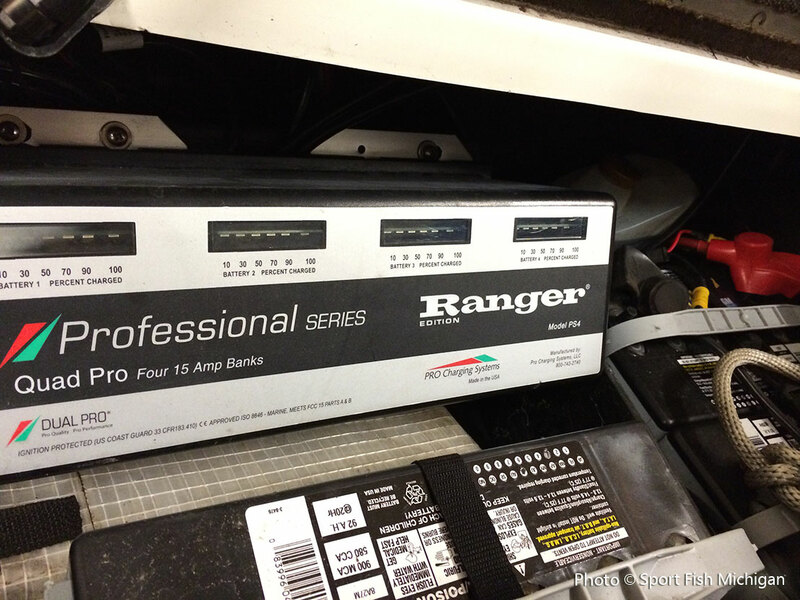 Charging boat batteries at the end of the season is a great way to keep batteries lively come springtime. A fully charged battery is better able to withstand cold winter temperatures if boats are stored in a cold facility or outside. If possible, topping off the charge mid-winter is another good idea. The ethanol in fuel these days can spell big trouble for boat owners. Long-term winter storage of gasoline in a boat’s fuel tank can be problematic without a fuel additive like Stabil. Phase separation is when water separates from the gasoline itself, and ethanol has a high water content in it. In the late winter and early spring, alternately warming and cooling temperatures makes phase separation a real possibility. In addition to a fuel additive like Stabil, a full fuel tank will also help. This obviously leaves less room for air, which will vary in humidity, and thus, in moisture. This moisture can lead to condensation inside the tank, which is no good. By taking a few simple steps at the end of the season, our long-anticipated spring fishing trips can be as enjoyable as we hoped they would be. Sure, the fish may or not be biting, but at least we can get out fishing without being sidelined with repairs. Proper boat, motor, and trailer maintenance before winter storage can go a long ways towards an enjoyable experience later. I believe that preventative maintenance is far better than repairs when things break. It’s often cheaper, too! It’s mid-November, and the snow is flying heavily here in northern Michigan. Many are in the woods chasing deer, following the firearms season opener just a few days ago. Coupled with the cold windy weather, this means that it’s time for most anglers to mothball their boat and store it for the winter. Here at Wolfe Outfitters, and those of us with Sport Fish Michigan that guide the Lake Michigan tributary rivers for steelhead, we will keep our boats in service all winter long, provided we have running water! Last winter, even rivers like the Big Manistee, Muskegon, and the Grand River froze enough that we were forced to reschedule many trips due to unfishable, icy conditions. For those that will put their boats away for the winter season, there are a few things that are advisable to do to help ensure a smooth and painless experience when pulling the boat out for the first time next spring. Our trailers are often an overlooked part of our boat package, but yet they play a crucial role. After all, we rely on our trailers to carry our precious boats to and from the lake or river, dunking it in the water each time. This tough kind of wear and tear can be brutal on trailers, and things like wiring, lights, brakes, wheel bearings, etc. can all suffer without routine maintenance. Now is a great time to service your trailer. I check over the trailer wiring, looking for kinks or breaks in the lines. I also look over the lights to ensure that they are working properly. Trailer lights are not only a safety concern if they don’t work properly, they are also a legal requirement in most states. 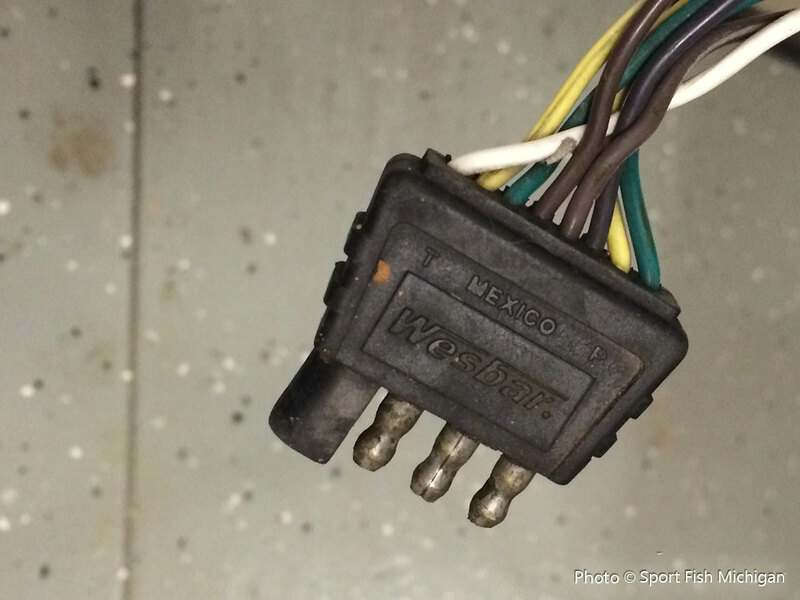 Another simple thing to check that often causes trouble is the wiring harness coupler that plugs into the vehicle power to connect the lights and brakes. This simple coupler can absolutely wreak havoc when the pins are slightly bent or have corrosion on them. Proper tire pressure is essential, not only for gas mileage when towing the trailer, but also for helping to prevent blowouts and unnecessary wear and tear to the treads. 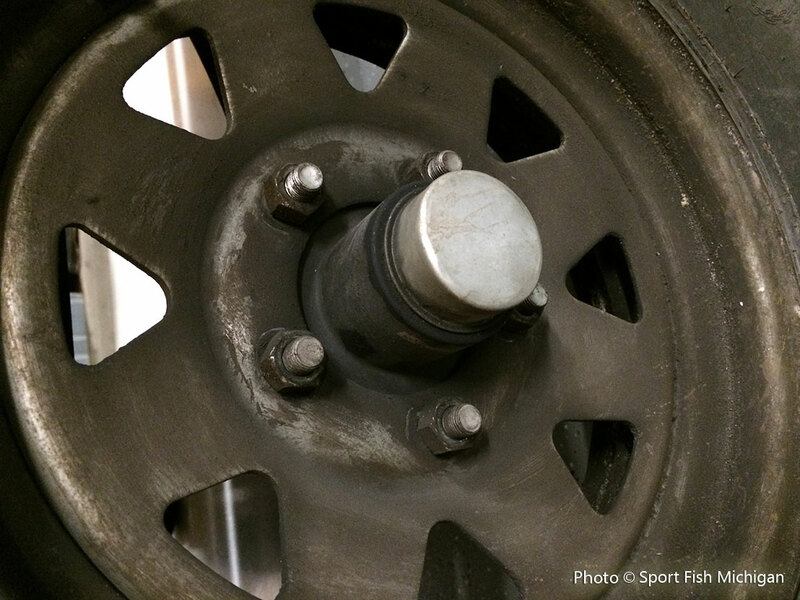 The wheel bearings are another too-often overlooked part of a trailer. Many blowouts on the road are actually a result of bearings that are worn out. Properly lubricating wheel bearings will help keep you on the road trouble-free, but good preventative maintenance also includes replacing the bearings. When to replace trailer bearings is really a matter of how much use they get. Guides that tow boats on a daily basis, like many of our Sport Fish Michigan and Wolfe Outfitters Guides, will have to replace wheel bearings much more frequently than those that tow their boats only a few times a season. New-style bearings like oil-bath hubs or the new gel-style make bearing maintenance almost a no-brainer. Compared to the older and much more common grease-style bearings, these newer technologies keep maintenance to a minimum. 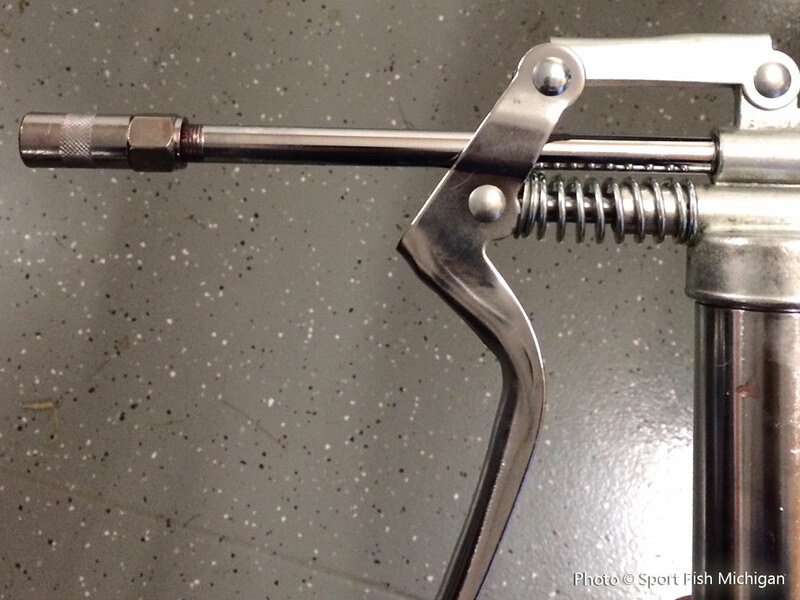 For trailers that have the more common grease-style bearings, a simple grease gun will do the trick. Regularly adding a bit of grease will go a long way towards longevity. One telltale to look for when determining if bearings should be replaced is the presence of water. If water gets pushed out of the bearings when grease is added with a grease gun, it could be a sign that the trailer bearings should be replaced soon, if not immediately. Water in the bearings means that the watertight seal has been broken. When the seal breaks, water gets inside the bearings, where it will not only break down the bearing grease, it can also rust the bearings themselves, or freeze in winter temperatures. A little bit of water under the dust cap isn’t a huge deal and can be drained out. But water in the bearings is a big deal, and taking care of this issue now can mean no roadside hassles later. Another thing that is crucial for those that have brakes on their trailers is to check them for wear and tear. Unless squealing or squeaking brakes have already been detected, checking the life of your trailer brakes is best done by a professional. Throughout the season, trailers with brakes should be checked to make sure their brake fluid level is topped off. Unless there is a leak, this is usually a once a season task. One more thing to check on a trailer is the tread on the wheels themselves. Make sure that there is enough tread on the trailers to safely transport your boat to and from the water. It’s advisable to carry a spare tire for your trailer and the appropriate tools to change a tire, should there be a flat while out on the road. I always carry a full wheel and tire so that I can make the change and keep going without having to worry about replacing a spare that may not be a match for the trailer tires. Keeping our trailers going is a big part of a fun day on the water. With some simple maintenance and preventative measures, we can help to ensure that we make it to and from the water without issue. Catching fish is hard enough as it is, without having to deal with a trailer breakdown on the road. 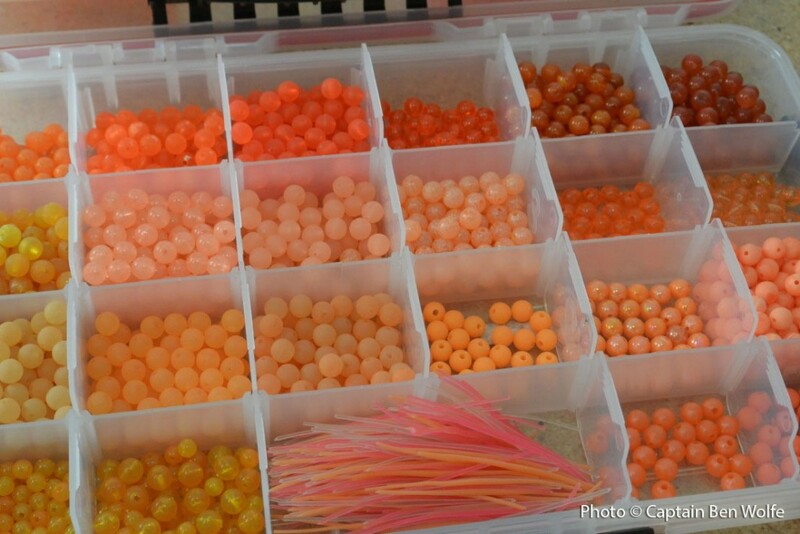 Beads, the colored orbs of the fishing world meant to resemble fish eggs, should be a clear choice for anglers targeting river systems for salmon, steelhead, and trout. Beads have been around for years, but are gaining popularity every year. New bead companies are now pushing the boundaries, offering new color choices and sizes. Increasing options like this gives anglers even more options to match bead colors with river conditions, and egg colors that can vary by species and location. Beads by themselves are simple. Made of plastic, in sizes ranging from 4mm to 12mm, with seemingly endless colors. Some beads are hard plastic, and some are soft plastic like rubber bass worms. Hard beads are slow to sink, making them perfect in river current-bouncing along the bottom and swirling, just as real natural eggs do. In contrast, the soft plastic beads float in the water. This makes them a great option to bounce along the bottom, resisting snags. The soft texture of these beads feel natural to a fish when they pick up the bead, causing them to hold on longer and giving anglers more opportunity to set the hook. The beauty of beads is their versatility. They can be fished by fly anglers or traditional gear anglers alike. They can be bounced along the bottom in a bottom-bouncing or side drifting technique, they can be used on a chuck and duck presentation, or they can be fished under a float. Meant to resemble a single egg, beads are typically pegged onto the line a couple of inches above a hook. Presented in this manner, beads can be fished by themselves or, more commonly, on a double tandem rig with two beads, or a bead and fly combo. Despite the proven effective fish-catching power of beads, there are those that don’t care for them. Some believe that fishing beads is not as effective as fishing bait-meaning cured or raw salmon eggs. Others believe that fishing beads is unethical, as the bead is traditionally pegged above the hook. Legally speaking, there are no restrictions on fishing beads-they are perfectly legal to fish, even when pegged onto the line above the hook. The main argument against the use of pegged beads above a hook seems to be that the bead is not attached to the hook, making it a snagging technique. Again, there is no legal restriction against this rigging presentation, and I would argue that there are other commonly used techniques that are just as, if not more, prone to snagging fish as the use of a pegged bead. Most of the bead fishing done by Sport Fish Michigan and Wolfe Outfitters guides uses beads fished under a float. I believe that it is difficult to snag a fish when fished under a float. In fishing, there is a time and a place for every presentation. Bait has a time and a place, and so do beads. There have been countless times that beads have out-fished bait. And the simplicity of beads means anglers don’t have to mess with getting and curing salmon eggs and tying them into spawn sacks. 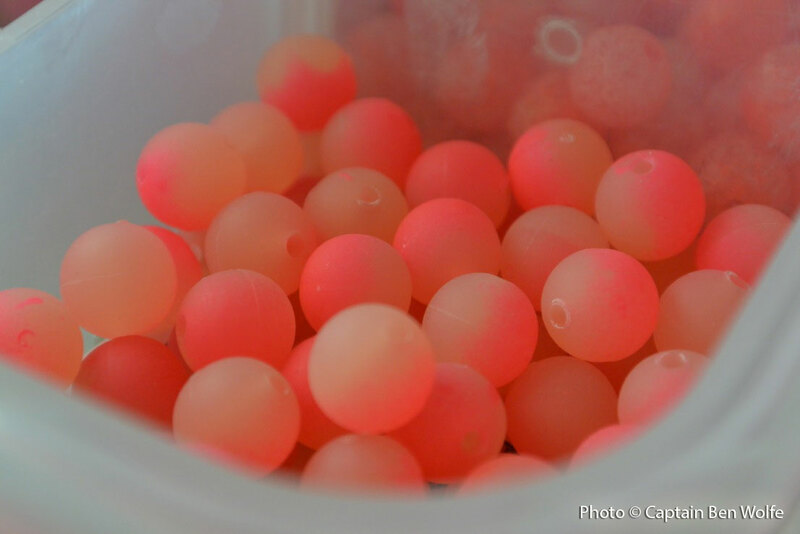 When fish are keying-in on single eggs, beads are incredibly tough to beat. Additionally, strikes can be enticed by applying different scents to beads. Alternately, when salmon or steelhead are keying in on larger presentations, spawn sacks or chunks of skein can be more effective. Beads offer versatility in rigging. Color and sizes give anglers a presentation that can appeal to a variety of species all at the same time. Salmon, steelhead, rainbow trout, brown trout, lake trout, and brook trout all eat beads incredibly well. In addition, we have caught walleyes, bass, bluegills, and even hooked up with sturgeon on bead presentations. Despite the limited controversy over bead fishing, their use continues to grow in popularity and effectiveness. I, for one, will continue to use beads, as they have proven themselves over and over on guide trips here in northern Michigan. Chasing trout, steelhead, and salmon, beads have a place in my guide box. There are many great bead companies, and the three that I use most are Trout Beads, Great Lakes Bead Company, and Steelhead Beads from the west coast. All offer something different, and all beads are not created equal. A bead isn’t just a bead, and it pays to experiment with color combinations and color differences. The way light illuminates a bead color can vary drastically from river to river, and fish may prefer one color or size to another in different systems. 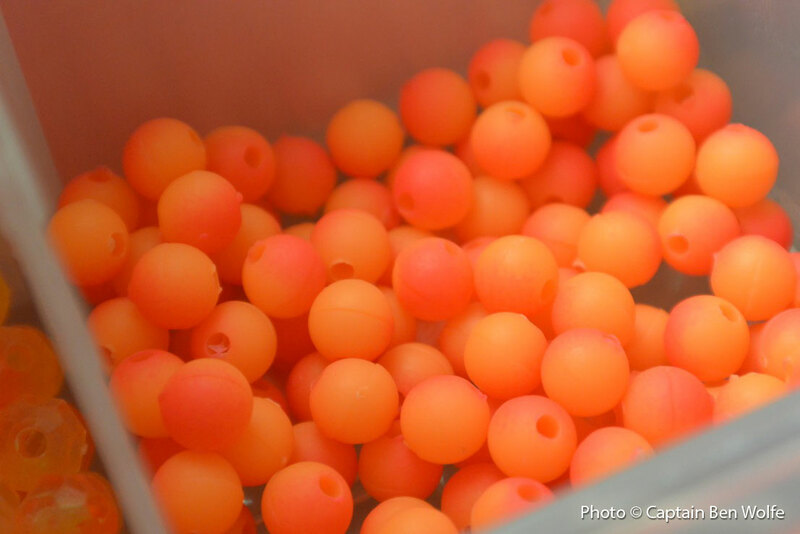 If beads aren’t in your bag of tricks, give them a try. You may be surprised by their simple effectiveness, and I’m sure you’ll agree with me and my Sport Fish Michigan and Wolfe Outfitter guides that beads may very well become a favorite go-to when chasing salmon, steelhead, and trout. Sport Fish Michigan is proud to be a sponsor of Hook n’ Look, starring Kim Stricker, which airs on the Outdoor Channel. Much more than a fishing show, Hook n’ Look offers viewers a unique perspective on angling – a view from under the water! Both Kim and his son, Danny, are experienced divers and they combine their diving and angling skills to provide viewers with unparalleled information gained by experiencing fishing from both above and below the water. Ben Wolfe, owner of Sport Fish Michigan said, "Education is a big part of what Captains and Guides offer to anglers, and understanding the underwater landscape is critical to success. This is a key premise of the Hook N’ Look program, and a partnership between Sport Fish Michigan and Hook N’ Look makes sense. Kim’s love of his home state of Michigan only furthers this partnership. Through the Hook N’ Look show, he often showcases the beauty and pristine nature that Michigan’s waters have to offer." "Sport Fish Michigan has a very similar goal: we aim to heighten each angler’s experience through a keen understanding of not only the pieces of the puzzle happening above the water, but understanding what is happening below the water, as well. Sport Fish Michigan’s Captains and Guides have years of experience on the water, and with our partnership with Hook N’ Look, we are excited to promote the world-class fishing that Michigan has to offer on waters that Kim (and Danny) have spent countless hours on filming their outstanding show." Visit the Hook n’ Look website. Tune into Hook n’ Look on the Outdoor Channel this weekend to watch “A Blustery Cup O’ Joe” featuring our own Captain Ben Wolfe!